Hola Lexicans! 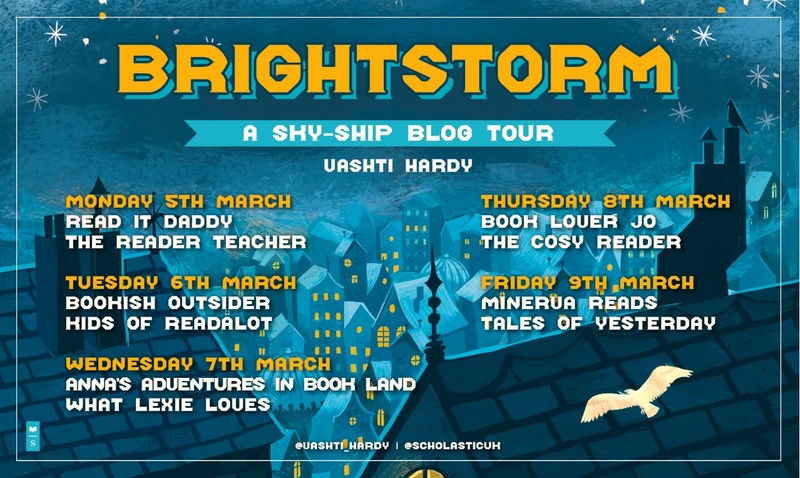 So a few days ago, the lovely Olivia at Scholastic emailed me asking if I'd like to read a new book coming out - Brightstorm and be part of the blog tour which started on the 5th and is ending on the 9th, and naturally I said yes. And so today is my turn to post a review on this new book which released last week on the 1st. 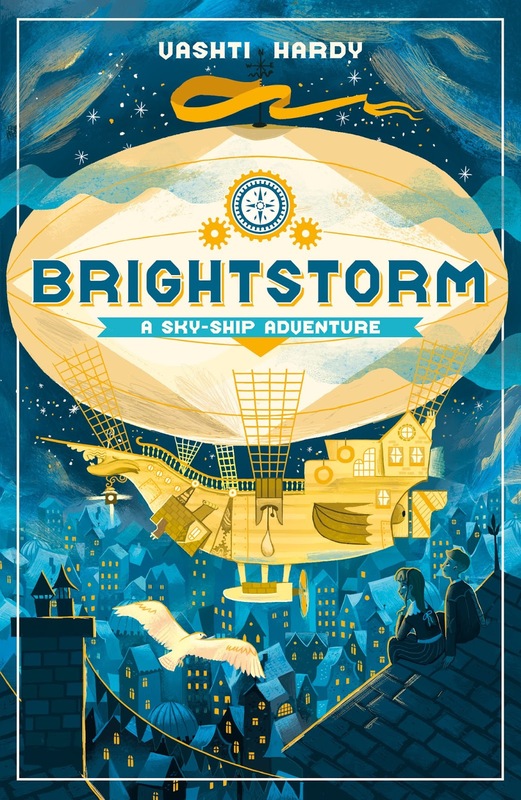 Brightstorm tells the story of twins Arthur + Maudie and their journey around the world. The story begins with the twins hearing the devastating news that their dad - an explorer has passed away on a recent expedition. But not only that, fellow explorers are now accusing the twins' father of stealing from his competitors before his death. 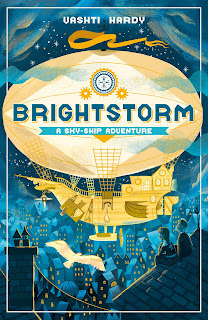 Desperate to seek life away from their dreadful new guardians, and wanting to prove their father's innocence, the two join Captain Harriet Culpepper's sky-ship - which is heading the same way their dad attempted to.. to try and find some clues as well as starting a new life. Ok I'll be honest I'm a terrible blogger I've been very busy so didn't have time to finish this book in time for my book tour date today (although hopefully I will do in the next few days!!) but I've got a good enough way in to the book to give an opinion and know that I'm really enjoying it. One of the things I love about this book is the crushing of gender stereotypes!! It's known that there is a ridiculous stereotype for boys being better at mathematical and scientific things, whereas girls are meant to be more creative and doing chores, but in this book, Maudie's biggest talent is engineering and Arthur's is cooking, which crushes those stupid stereotypes. There's also a badass female explorer (Harriet Culpepper) who I love!! 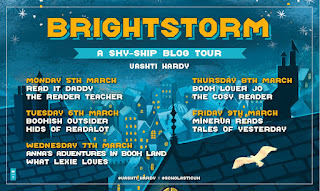 Another thing I love about this book, is Arthur has a disability, but it doesn't stop him at all - and whilst Vashti (the author) addresses his disability, it doesn't affect him much. And then not only do I love the characters, but the plot is very interesting and clever too. I'll be honest.. the book is a sci-fi/fantasy with an element of mystery which (except the mystery) really isn't my cup of tea normally, so it took a little bit of time to get into but now it's got my attention and I really enjoy reading it - it's a nice break from the YA contemporary books I've been reading lots of lately(!!). As you know, I haven't finished it yet so I can't give a full opinion of the plot - but so far it's gripping, fast-paced and intriguing. Thanks for commenting Ana!! It is a really good book, so I think you'd really enjoy it, and hopefully your little sister too. hi lexie!!! this isn't relevant to the post but i feel like we've lost touch as blogger friends haha :) how are you doing?